Posted October 17, 2018 by Staff Writer & filed under Arts & Entertainment, Theatre & Performance. Maeve Marsden is one of the busiest creatives in the country: writer, performer, producer, gin connoisseur. Her success with Queerstories, a live storytelling event that spawned a book and podcast, has inspired her to create Homage, a live show in which queer performers are invited to sing songs made famous by known queer artists. “I’m running the queer events I really want to go to […] I want to listen to stories and listen to really good musicians singing interesting songs,” says Marsden, explaining the motivation for creating these shows. Homage, as with Queerstories is intended to be as much about socialising as being entertained, so the program includes a DJ who’ll be playing background music before the show and during the breaks to encourage people to mingle. The performers for the inaugural show include Brendan MacLean, Sports Bra, Jordan Raskopoulos, Marcus Whale, Benhur Helwend and they’ll be covering songs from verified queer artists, that is, artists who are/were out or were undoubtedly LGBTQI. Songs will be an eclectic mix, coming from such artists as David Bowie, Dusty Springfield, Col Porter, Jimmy Somerville, Troye Sivan, Janelle Monae, Rainbow Chan and spanning styles across jazz, rock, pop, punk, country and non-categorised. “I’m able to offer an event that my community really loves, and it matters to me that I do it well. I take the role really seriously, I care deeply about making sure my programming is diverse and the quality is always good,” says Marsden. Each performer will speak briefly about the song they have chosen; why it was important to them, how it helped shape their own identity or creativity; why they connected with the song. It promises to be an enlightening as well as thoroughly entertaining night. 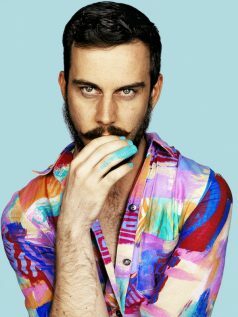 “There’s an incredible depth of queer talent in Australia,” says Marsden. This will be an opportunity to showcase some of it.